A shout out goes to Akhen3sir for catching this one, it was his annotated this shadowy illusion that made me to tale a closer look. I had to dig out my scans and look closely at the grain to to confirm I was wrong. And threw the power of revisionist blogging I will attempt to put a better spin on the error of my previous post. Based on the optical illusion I will call the shadow stack, it looks like there is a stone leaning on #56 in this picture. It has been suggested that this was not the case, and it was shadows playing tricks on me. After examining the photo at greater magnification and levels of enhancements, it became apparent that the horizontal grain of the near prone Stone 55 was eclipsed by the vertical grain of the more upright Stone 56, and that was a trick of the eye that connected the contrast points to make it look to be resting on top 56. The shadow of Stone 16 added to the illusion. This closeup better shows the “grain” of the two stones. In either case with a little help of the computer, this fine old photograph has cleaned up nicely. No matter what the date turns out to be, it is by far the oldest photograph showing a visitor at Stonehenge in the gallery. 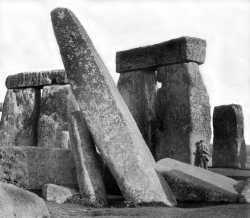 This entry was posted on January 4, 2011 at 3:04 pm and is filed under Stonehenge. You can follow any responses to this entry through the RSS 2.0 feed. You can leave a response, or trackback from your own site.